I have decided to attempt a triathlon because I like a challenge and I am a wee bit nuts. In case you don’t know, a triathlon is an athletic event that features swimming, then biking, then running all to a finish line with other nut cases. The story behind my choice to train for such a thing has to do with a number of different factors. The biggest motivator is that I have been running 5K races and finishing them (eventually). No, I am not the fastest or the cutest and I have almost thrown up multiple times but somehow I keep coming back to doing them. I love the “race” with other people all wanting to be athletic. This group of people is very inspiring and healthy and many have been in my age bracket. The running (for me) would be the most challenging part of any triathlon because I stink at it. Swimming is where I have an advantage since I was a competitive swimmer in my youth. I happen to really like biking so that will help. I found out that there are events called “sprint” triathlons. You swim 500 yards, bike 15 miles, and run 3.1 miles (5K). One of these is hosted in a town near me, Greenfield Massachusetts, and has been going for over 30 years! How about that? Greenfield even has a training program that anyone can sign up for. 500 yards was my race in high school – check! 15 miles is not very far on a bike. I went onto Craig’s List and found a spin bike for $100 and I plan to train on it. I don’t have a bike for the race right now as my current bike weighs about 400 pounds and has a very large seat. It is a great cruiser but not really for “racing”. I continue to do 5Ks even though I hate running. Maybe some day I will like running so I don’t give up. My local library had a book for beginning triathletes and I checked it out. It promoted a 12 week training program. Ummmm, heck no! I was thinking of a 12 month training program which is far more my speed. I have my race picked out for next August and I started training. The best part is that this challenge got me back in the pool. I found myself on Monday morning, before work, outside in a public pool ($1.50) swimming back and forth like the old days. It was so fun!! 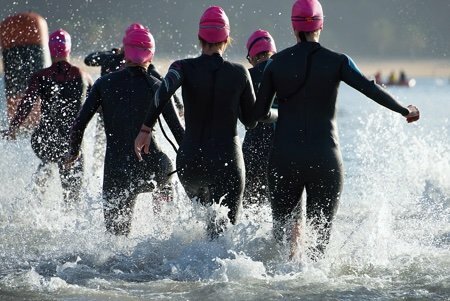 Why the triathlon? The real reason is that I get seriously bored with exercise and I want new challenges to keep me motivated. I love working toward a goal and this seems like a doable one. Have you tried a triathlon? How did it go? Go for it! I wanted to try one but I can't run due to my hip repacement. It's a great challenge. Go for it! My husband is a competitive amateur -- meaning, not with the pros --- in the next distance up (Olympic/international). Also, necessities: a fitting for run shoes, padded bike shorts, and a tri kit for race day. We live in an area with a big tri club, which has been awesome for both of us because we've met a lot of great athletes and spectators. Oh, and both of us have learned how to do basic bike repairs. He races with a little pouch with an extra tire and some tools and an air canister on his bike and actually managed to fix a blown tire during a race. I can do some basic assembly and disassembly, which has saved us $$$$. I highly recommend learning that stuff! Best wishes for success! I admire your determination. Good for you! You got this, especially since you have a lotta time to train😊 But the important thing? Have fun all the while! Otherwise it's just work! @asakiyume - I participated in a Sprint tri & only did the swim. My friend wanted to try it, but she was not a good swimmer; see if your husband can pair up with 1 or 2 others to start. Maybe you do the swim? And, Snack Girl, these folks were fun to watch in terms of the athletic mindset/lifestyle (even more so than the 5K folks) - a whole other culture that I'm not used to!